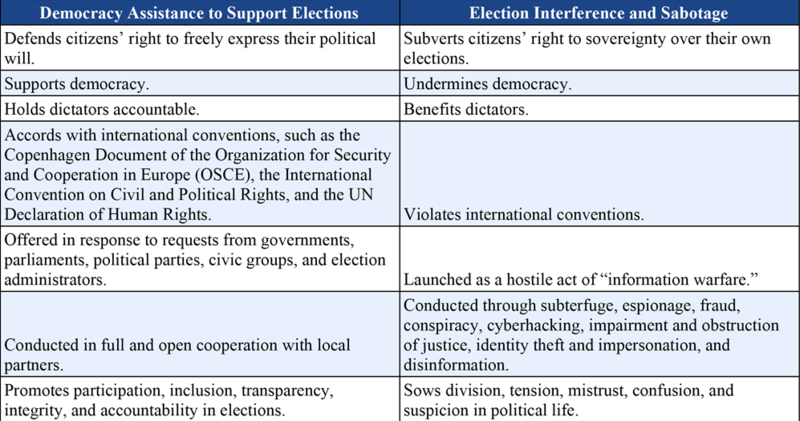 Some have argued that election “meddling” by Russia and other authoritarian regimes is ok because “everyone does it,” drawing a false comparison with democracy assistance. Make no mistake: democracy assistance has absolutely nothing in common with the cyber-hacking and disinformation efforts of authoritarian regimes, who are afraid to hold legitimate elections at home. To equate the two is like saying that a doctor who administers a cure and an individual posing as a doctor who administers poison are morally equivalent because they both “meddled” with a patient. Authoritarian countries refuse to hold legitimate elections at home, and undermine open election processes abroad for their own strategic purposes. Domestically, opposition political leaders are harassed or assassinated and opposition parties are de-legitimized and frequently barred from the ballot. Independent media is muzzled. Civil society groups seeking to monitor election processes are shut down and persecuted, and, in some cases, their leaders are imprisoned. Voters are denied the right to express their free will and the results are predetermined. Elections are held in name only. "Russia and America Aren't Morally Equivalent" by former Deputy Assistant Secretary of State and USAID Assistant Administrator Tom Melia in The Atlantic. Defends citizens’ right to freely express their political will. Subverts citizens’ right to sovereignty over their own elections. Accords with international conventions, such as the Copenhagen Document of the Organization for Security and Cooperation in Europe (OSCE), the International Convention on Civil and Political Rights, and the UN Declaration of Human Rights. Offered in response to requests from governments, parliaments, political parties, civic groups, and election administrators. Conducted in full and open cooperation with local partners. Conducted through subterfuge, espionage, fraud, conspiracy, cyberhacking, impairment and obstruction of justice, identity theft and impersonation, and disinformation. Promotes participation, inclusion, transparency, integrity, and accountability in elections. Sows division, tension, mistrust, confusion, and suspicion in political life. Contributes to peace and stability. Designed to exacerbate social division and internal conflict. Helps citizens make informed political choices. Focuses on strengthening the process, not determining results. Corrupts the process and seeks to alter outcomes in breach of voters’ will. Funded through agreed-upon international frameworks for development cooperation. Funded by a web of illicit revenue flows, including links with organized crime and corrupt enterprises.